So the numbers sounded daunting, but when I figured it out in my head it wasn’t that bad. I had to find something to make myself believe it was possible. Yeah it was a lot of climbing (some sources say over 3800m, some say just under 5000m. My Garmin measured 4600m) but stretched out over 189 miles, the ratio of distance to elevation wasn’t dramatically worse than my commute to work. So I rationalised the challenge in this way; it would be similar to cycling to work 18 times. Yeah it’s still a really long way, but I could probably manage that if I could keep my energy levels up. 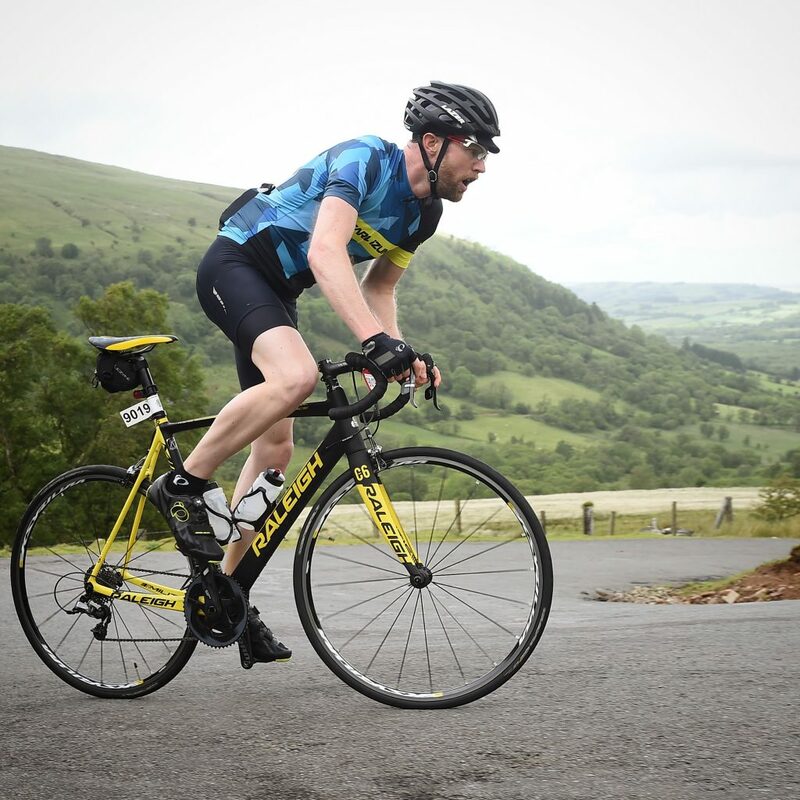 I asked around and heard a few stories about riders doing the next distance down last year (Grand Fondo 143 miles – 230km) and thinking they could manage the Dragon Devil next time. It still sounded hugely challenging, but I was beginning to convince myself it would be possible, at the very least not as bad as it sounded. So I headed down the evening before to my waterlogged campsite. The weather for the day was forecast to be rain/hail showers and winds gusting up to 35mph, so not “ideal” conditions for something already very challenging. I pitched my tent, ate some food and headed to bed as early as possible, hoping sleep might clear the last of the cold I’d suffered with all week. With a 6:45am start time, it was going to be an early start. Not wanting to pack down a tent in the morning, and fearing I may be a little tired, I’d booked to stay the following night too. 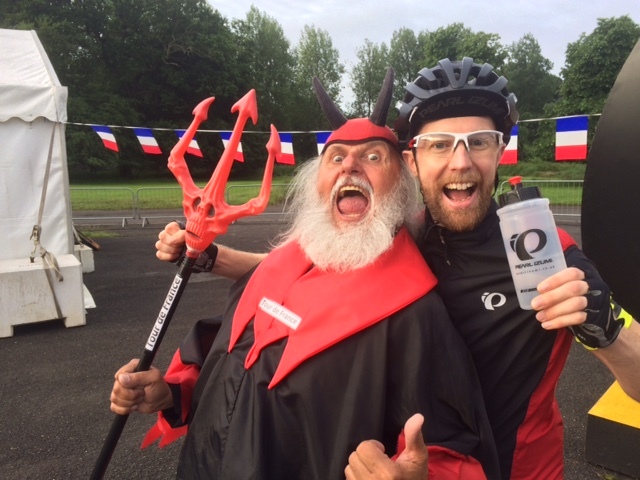 The early start for the Dragon Devil route meant that the event start was pretty quiet, but I did spot Didi the Devil (the Devil from the Tour de France) pretty quickly, and took some photos for him on his camera before taking a few selfies with him. I hung back a bit at the start, not wanting to be in the first wave of riders out of the gate. My logic being that if I had a good day and set a good pace I’d rather be moving through other riders instead of off the front with no one to work with, perhaps a little ambitious for a challenge I wasn’t sure I would actually finish! It’s a fine line to tread; if you go fast then you set a good time and complete the challenge quicker with greater satisfaction (or just to personally test yourself), but go too fast and you risk not completing it at all. As nobody I knew fancied joining me on this delightful little spin around the countryside, I’d somehow decided to go for a decent time as well. I started fast, finding a few riders who wanted to get moving. But most didn’t take a turn at the front. Soon there was just two of us as we tried to catch the earlier wave of riders. We caught the bulk of them by the first major climb. We were going uphill at some points with a solid tailwind at 27mph, this did not look good for the afternoon where we would face this as a headwind! Many of the climbs were “alpine style” as advertised. the roads winding gently upwards to the summits rarely getting very steep. Long seated climbs where you can tap out a good rhythm were followed by long charging descents (where the wind allowed). So whilst you were climbing at 8-10mph up one side, it could be 40mph+ (where the wind allowed) and long descents down the other side. It’s the kind of terrain that flatters your abilities. As comfortable as you want to pace it on the way up, and charging flat out down the other side. So apart from a couple of steeper climbs like the Devil’s Elbow and the Devil’s Staircase it’s actually quite fast and comfortable riding. That’s not to say it’s easy though, as I was to find out. When the routes split for the extra “Dragon Devil” only loop, this is probably the hardest bit. It feels like you’re in the middle of nowhere for a start. No signs of civilisation, and just relentless and tiring little hills. Nothing flows, nothing is flat, and it takes lots of energy. It’s a bit like 40 miles (70km) on the back roads of Shropshire or the Peak District. This is where things started to fall apart for me, about 200km or 125ish miles into the ride. It was cold in the rain with the windchill, and I hadn’t bothered putting my gillet on which may have kept me warm and used less energy. I was loosing feeling in my left hand and had started to change the front gears (mechanical) by reaching across and using my still functioning right hand. I’d started to bonk too (running out of energy) and was trying to get some food or gels into my face (using my still functioning right hand). I was in a group of four at this point and I was struggling to manage all of the above without pushing too far into my energy reserves. I’d started making strange groaning noises too which didn’t seem to help anything, and made me look weird. But I couldn’t help it. I started thinking “Sod getting a good time, I’ll be lucky if I complete this thing!” Then some sweat and rain rolled into my eye, then the other. I closed my eyes as they started to sting, groaned some more and tried to dig deep waiting for the gels to kick in. It didn’t work, I was cycling completely out of energy with my eyes closed wobbling all over the place. It had overcooked it and not eaten enough. I had to stop and take a moment, I dropped off the back of the group, stopped for a moment and ate some food at the side of the road to try and pull myself together. I would damn well finish this thing, even if it took all day! 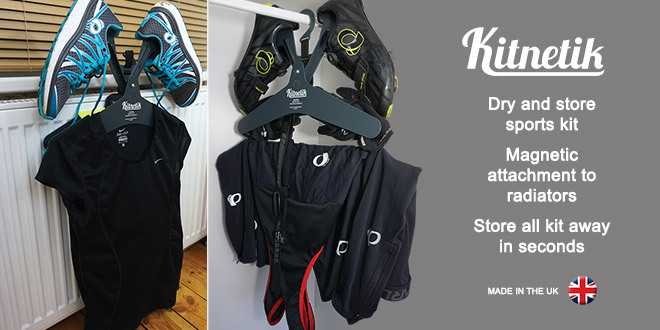 I stopped again shortly after to try and put on my gillet, but my cold and numb left hand couldn’t manage the zip, so I had to leave it flapping until the feed station where I found a stranger to zip it up for me. I never expected my hand to go numb from cold in June, but then I’d normally not cycle for 11 or so hours in 35mph winds and driving rain, so I guess that’s why I’d not been prepared for this kind of thing. I’d found a well matched rider, and we were working well together. I would climb away from him when it went up, but when it flattened out he could smash out some serious speed (time trials are his thing). So when I was ahead I would bide my time in the crowds of riders riding the shorter distances and wait for my “taxi” to arrive. I’d be chatting away to someone when he’d pull alongside, look at me and I’d jump on his wheel again. We’d take turns to keep the pace as high as we dared, and if we collected a few wheel suckers along the way we’d attack on a little rise and drop them all (wheel suckers never take a turn on the front). After the long climb of Black Mountain, and the annoying little climb up through the houses near the end, we gave it everything we had. It was a two man TT to the finish, I’d look down at my Garmin on the flat dual carriage way and see some much higher numbers than I imagined with 180+ miles in our legs. At that stage the effort just burns in your muscles, you’re counting down the final miles on your Garmin as you approach the finish. How long is it supposed to be? 186? 189 miles? We’d both gone a little wrong thanks to some random yellow arrows in the extra loop section, so we couldn’t be certain. How long can you hold that burning in your legs? “Coming through!” A shout to riders from shorter routes blocking the whole side of the road. One last effort and it’s over. I cross the line, my hands in the air like I’ve won something. 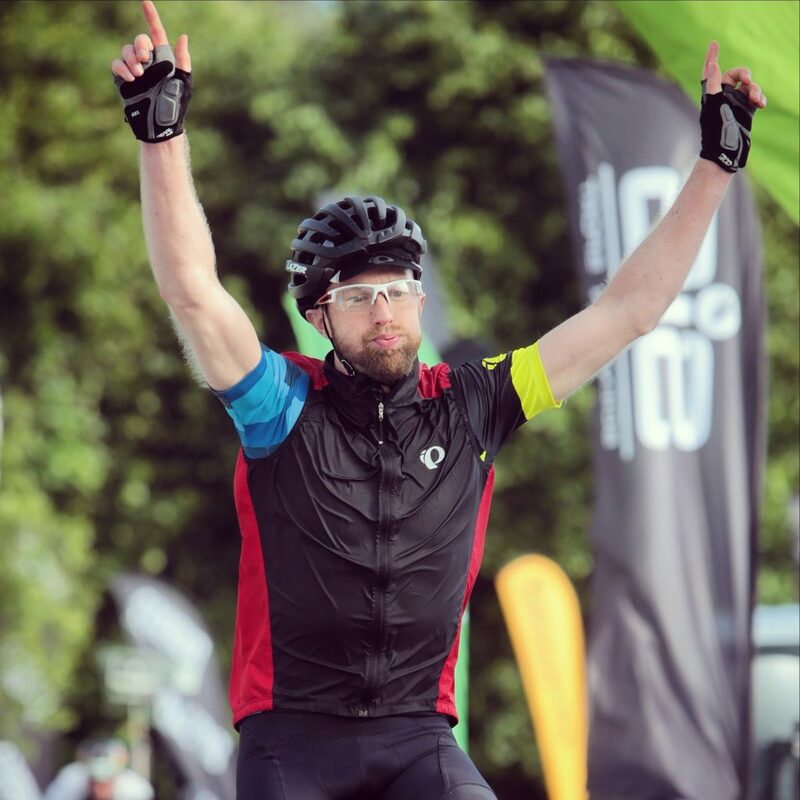 I haven’t won anything but in my view any 190mile (307km) ride deserves a hands in the air celebration when it’s finished. I had wondered in the morning whether I wanted to ride an extra 10 or so miles just to nudge the daily total over to 200 miles. But at the finish, I’d given it everything I had, I could barely walk. I wasn’t riding anywhere further than I had to, and I think that’s the way it should be. Get me a pizza and watch me collapse into a soggy tent! Would I do it again? Well that’s the thing about the Dragon Ride, there are many things you can do. There is a multi day tour as well as just the single day routes. The ultimate would be the multi day event (Dragon Tour) finished with the Dragon Devil route. Now that is a lot of riding, and in good weather it would be beautiful riding too. It’s what everyone wants to know before the event, will my Garmin battery last for the whole thing? I used my Garmin 810, I turned the back light off and did not use any navigation or bluetooth to save the battery. I used a heart rate strap and wheel speed sensor and I completed the course in 11:13:40, with 10:55:54 moving time (that’s 6th place overall if you need to gauge where you might finish). When I’d finished the battery still had ~40% remaining. So for most people that’s a yes. 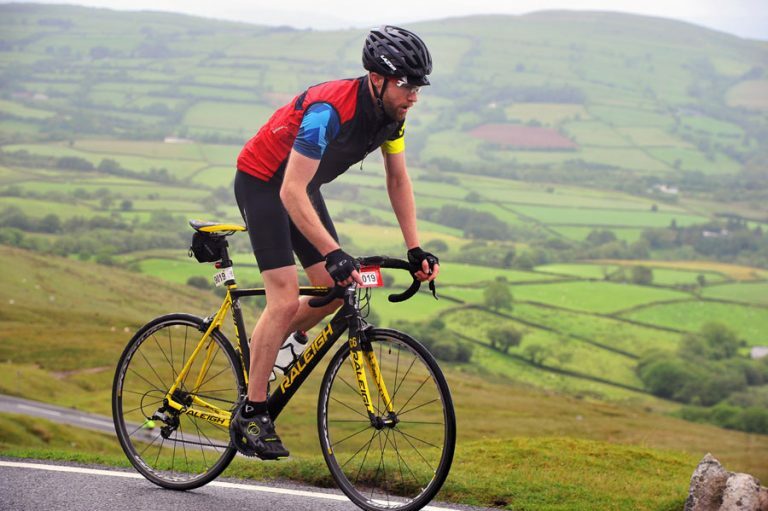 Great ride, really great ride, nice write up too. Had a clubmate do this in some miraculous time and finish 3rd overall. Incredible route and bad weather I hear. Not sure I’d fancy this. I could do it, eventually, but would I enjoy it? Probably, in a masochistic way! Great story..in the bottom picture you look slight relieved! Was this the finishing line?? I had the stinging eyes too – from rain & sweat on Black Mountain. Uphill, headwind, driving rain. Lovely. A plan has been hatched. Thanks for the write up. I have just entered this years Dragon Devil.